Get the team out for some fun together and see if the big man can dunk! 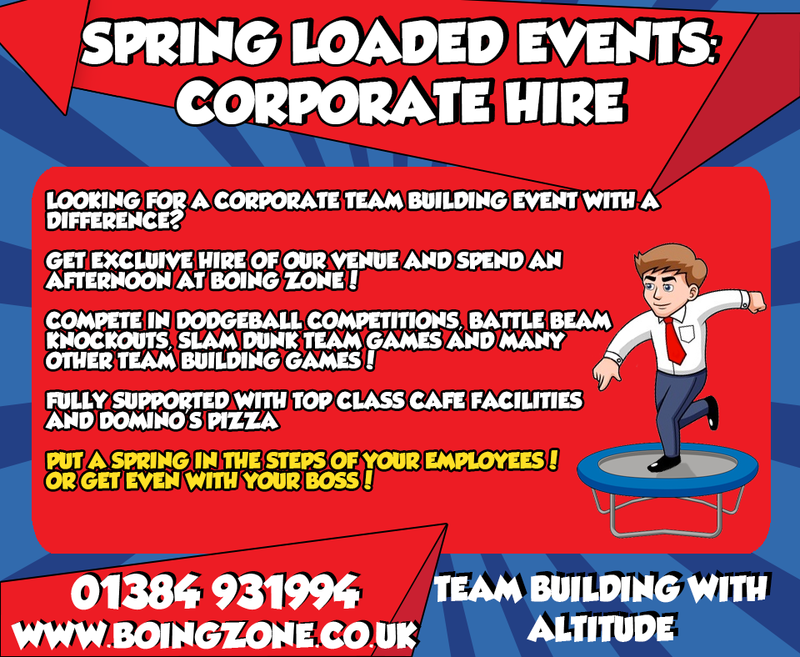 BOING ZONE will make your corporate event a blast. Whether you are looking for a great team-building activity, searching or an innovative way to have a product launch party, need a fun place for your company’s annual family day, or simply want to add excitement to your corporate function – our staff will BOING ZONE into action and help you plan the perfect corporate event. We can accommodate groups of up to 100 with a meeting room for up to 30 people that will trigger your creative juices and our BOING ZONE café will be happy to fully cater your event. Unlimited options available, from an hour-long jump session to a full facility rental with catering, music and conference facilities for your guests. Private room bookings allow you to order BOING ZONE catering, and they’re also good spaces to plan and brainstorm. The best thing for thinking outside the box is sometimes just jumping out of it. BOING ZONE has a limited capacity of 50 jumpers, so to avoid disappointment please confirm your numbers prior to booking or at least 7 days in advance. There may be a chance that any extra guests on the day will not be allowed to jump. 50% deposit must be paid upon confirmation of event to secure your space. Booking times are made on the hour every hour for a duration of one hour or more if required. Please ensure you and your guests arrive 15 minutes before to allow time for processing and our safety briefing. The function room with food and drink if required, will be available after your jump time. Please advise if there are any food allergies and we will endeavour to accommodate them if you require catering. Due to Health and Safety regulations we have a strict policy against bringing any outside food and drink onto the premises. Please be sure to read our safety rules and guidelines found on our website and displayed inside BOING ZONE . All your guests are required to complete an online waiver.